My initial plan was to head west to Ogallala or Julesburg and re-evaluate. By the time I arrived at Ogallala around 1930z, a cell was already developing southwest of Julesburg, so I continued west to I-76 and ventured into Colorado to intercept the storm. 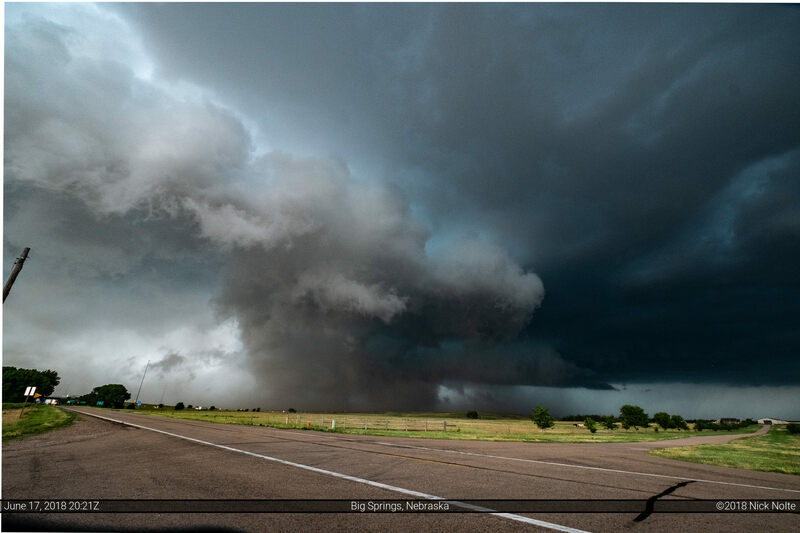 The storm had been tornado warned at this time and right around 2020z a report came in regarding a brief tornado in an open field northwest of Julesburg. 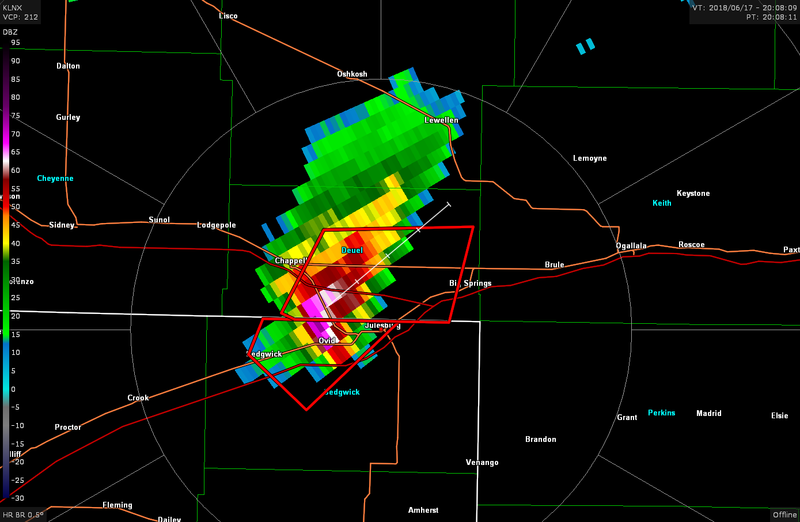 That would have been right around the time of the following shot, but I never got visual on any tornadoes. But, there was quite a mass of rain in there, so who knows what was hiding behind it. 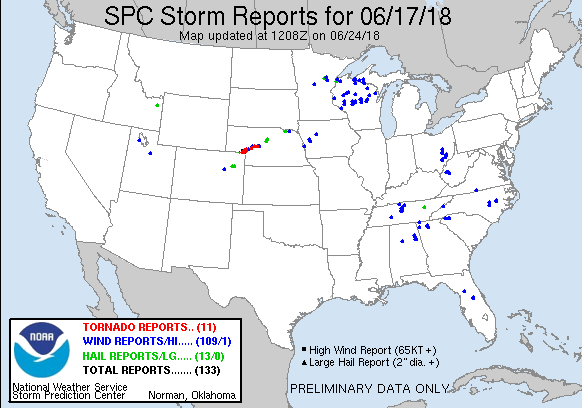 A couple additional reports came in over the next half hour indicating brief tornadoes as the storm tracked from north of Big Springs towards Lake McConaughy. I decided to cross the Kinglsey Dam to head east towards Keystone as the recreation area was being evacuated because of the tornado warnings. I ended up crossing the dam just as the brunt of the storm was crossing it, 60 to 70MPH winds buffeted vehicles on the dam while golf ball size hail fell from the sky. I got back out in front of the storm east of Keystone, but roads became few and far between as the storm drifted northeast away from the river valley and into the sandhills. At North Platte I took US 83 north to try to get back to the storm, unfortunately as I finally caught back up south of Stapleton the storm had begun to weaken and bow out. 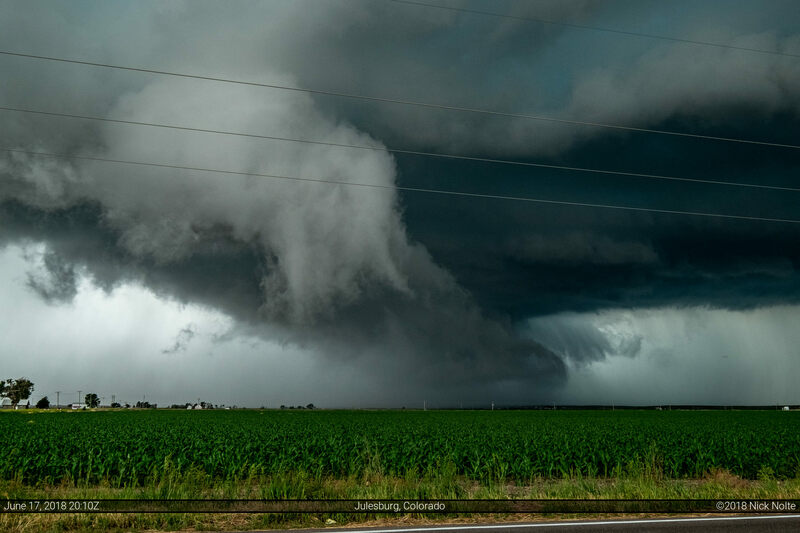 Despite that I continued to follow along with it as it trekked northeast, but once I got to Dunning it became clear that I would not be able to keep up with it as it moved across unfavorable terrain and darkness began to fall. I hit highway 2 at Dunning and began the trek home.